The new program aims to streamline quality measures providers are required to meet, rewarding outcomes rather than micromanaging processes. The Centers for Medicare and Medicaid Services will take a new tack on quality measurement with Meaningful Measures, a new CMS initiative aimed at reducing the hoop-jumping required of healthcare providers, Administrator Seema Verma announced Monday. She said the new approach would streamline the measures hospitals and physician practices must report on, focusing only on those most essential to care quality and improved outcomes. "We need to move from fee-for-service to a system that pays for value and quality – but how we define value and quality today is a problem," Verma said in a statement. "We all know it: Clinicians and hospitals have to report an array of measures to different payers. There are many steps involved in submitting them, taking time away from patients. Moreover, it’s not clear whether all of these measures are actually improving patient care." 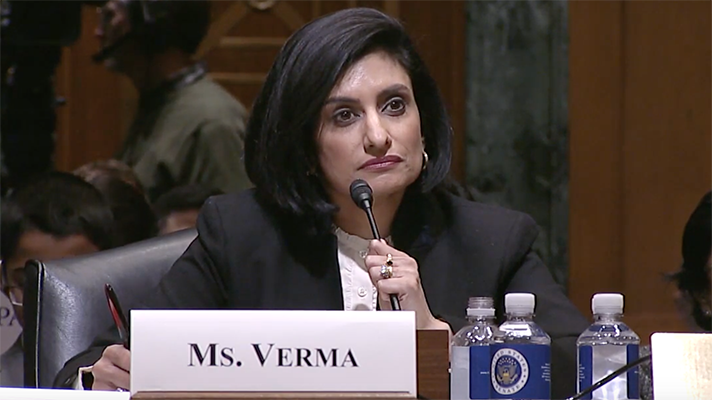 Speaking Monday at the Health Care Payment Learning and Action Network, Verma highlighted other changes at the agency, such as recent moves to bring more flexibility to its Innovation Center, and some steps to reduce the regulatory burden as it implements the Medicare Access and Chip Reauthorization Act. Meaningful Measures, which was developed in collaboration with the Learning Action Network, the National Academies of Medicine, Core Quality Measures Collaborative and the National Quality Forum, will assessing those core issues that are the most critical to driving quality improvement, said Verma. "It’s better to focus on achieving results, as opposed to having CMS try to micromanage and measure processes," she said. "The ultimate goal of Meaningful Measures is to direct efforts on high-priority areas." She likened the layering of rules upon rules to the paint on a house. "Typically, repainting needs to occur every few years and before you repaint, you need to strip out the layers of paint from underneath," said Verma. "Unfortunately, CMS has been applying new layers of paint without taking this essential step." The Trump Administration is "beginning to peel back the layers," she said. "We want to know the impact of current regulations, so we’re going through all of them and asking: What’s the purpose? Is this required by Congress? Does it make sense, does it help us prevent fraud and abuse? Is it duplicative? Does it meaningfully impact patient care and safety or improve outcomes? If not, then why do we have the regulation in the first place?" CMS also recently launched what it's calling the Patients Over Paperwork Initiative, a program in which it works with provider groups to identify needless burdens and improve efficiencies. Nearly three-dozen healthcare organizations are working with the agency to help spot areas where regulations could be streamlined, such the American Hospital Association, the American Academy of Family Physicians. Verma pointed to a recent report from AHA that showed how U.S. health systems are expected to comply with 629 mandatory regulatory requirements and spend nearly $39 billion a year on the administrative activities to help them stay in compliance. An average hospital, according to the report, dedicates 59 full-time employees – more than 25 percent of whom are trained physicians and nurses – just to regulatory compliance. "That’s a lot of provider time, money, and resources focused on paperwork instead of patients," said Verma.